In an attempt to lower the amount of solder fumes that I breath into my lungs while soldering, I searched the net for cheap solutions, and found lots of great do-it-yourself examples! See for instance Kip Kay’s video. Most examples use a fan (a computer chassis fan or equivalent) and an active carbon filter. It seemed like a great build-it-yourself quick project, so I got to work! 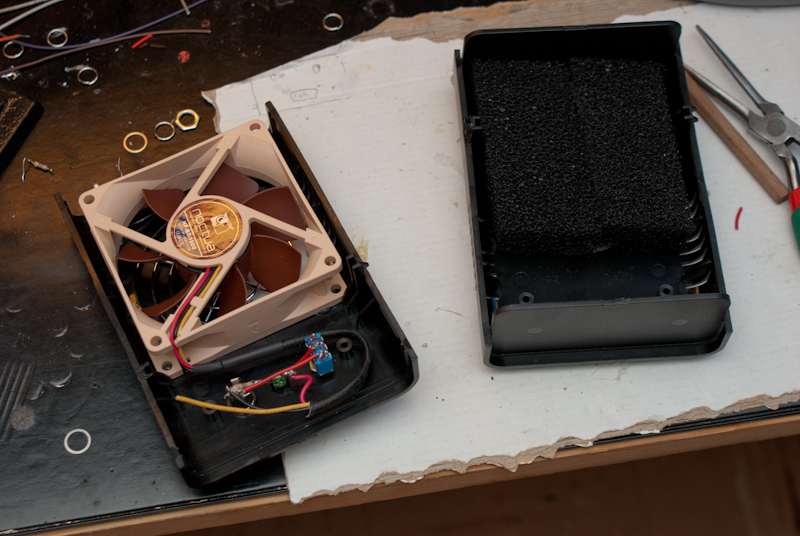 I used an old computer fan I had lying around and an old project box that I bought a while ago (for an other project, but it didn’t quite fit my needs that time). I never really liked the box so it too has just been lying around. But not anymore. I bought some active carbon filter from a local pet store (it’s for cleaning the water in a fish tank, I believe) and mounted the whole thing together. The fume extractor, almost ready! I added a switch and a LED, because you can never use too many LEDs, right? I’ve had the thing for a few weeks and I have to say, it really does work. I can see the fumes get sucked into the box and nothing comes out on the other side. But the best thing is that the smell is almost completely gone. Don’t get me wrong – I really do like the smell of solder fumes. To me, it brings back great memories of soldering stuff when I was a kid and my dad and I would build stuff at the kitchen table. But I’ve read the fumes are really not good for you, at least if you inhale large amounts of it. 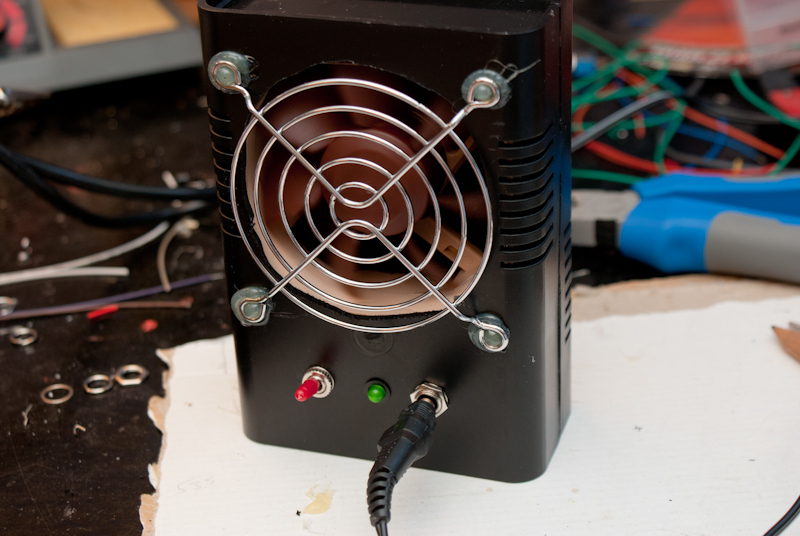 Which I don’t perhaps, but this project was fun and it sure doesn’t make things worse, so I’ll continue to use my DIY solder fume extractor! DIY Fume Extractor - it works! Manufacturers and exporter of Soldering fume extractor and fume extractor for soldering. Our soldering fume extractor is highly demanded at clients place for better usability and quality used technology. what is the circuit for that? i have problems when i add a switch. when the switch is on the fan is spinning but the led doesn’t light up, but when i turn it off (of course the fan stops spinning.) but the led lights up. how do i fix this? thanks.